The outgoing president brought stability, but left a great deal undone. With Joko Widodo set to be inaugurated as Indonesia’s new president next week, there has been no shortage of commentary reflecting on the legacy of his predecessor Susilo Bambang Yudhoyono, whose decade in power will soon come to a close. On September 26, I attended a speech by the outgoing president at George Washington University in Washington, D.C. to see what the man himself had to say about his legacy and Indonesia’s future. Though the 25-minute speech was focused on security and conflict resolution and directed at encouraging more great power cooperation, his portrayal of Indonesia under his watch was rather sunny. And to be fair, Yudhoyono does deserve immense credit for giving Indonesia a decade of political stability and economic growth in the aftermath of the Asian financial crisis of 1997 and the overthrow of Indonesian autocrat Suharto. He also did begin to address during his tenure critical issues facing the country ranging from terrorism to infrastructure development, even though much, much more remains to be done. Even so, some of the president’s statements came across as much too celebratory. Yudhoyono boldly declared Indonesia had “consolidated” its democracy but was silent on how the country’s outgoing parliament had – just hours before his speech – passed legislation eliminating local elections taking the country back to the Suharto era (though he later passed a decree to suspend the law, the president’s previous inaction on the issue had sparked outrage in Indonesia). He cited impressive economic figures without mentioning the structural deficiencies that remain in the Indonesian economy, including its Byzantine bureaucracy and rigid labor market. And as he said Indonesia would promote the “true face of Islam,” one wondered what the country’s religious minorities, which have seen their rights eroded over the past few years, might have to say about that. 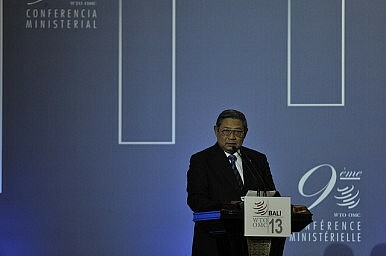 Abroad, there is no question that the political and economic stability during Yudhoyono’s tenure has allowed Indonesia to become more active in the foreign policy realm, both as a regional leader in the Association of Southeast Asian Nations (ASEAN) and as a global player in forums like the G-20 and the United Nations (UN). In his speech, the president spent a lot of time on the idea of a “dynamic equilibrium,” a “condition” where institutions and mechanisms build strong bonds of cooperation and interdependence between ASEAN states and outside powers so that they can work towards common security in the Asia-Pacific despite their differences. He also mentioned the Bali Democracy Forum launched in 2008, which remains the only intergovernmental forum for sharing experiences in political development in Asia. Yet Indonesian foreign policy under Yudhoyono has also suffered from several limitations due to a confluence of external and internal factors. Internally, rising nationalism has led to mounting frustration regarding ASEAN in some quarters, while Indonesia’s own problems at home have at times undermined its soft power abroad. It was far from ideal, for instance, when Yudhoyono had to spend so much of his speech to the Bali Democracy Forum last week discussing the parliamentary vote eliminating local elections. Externally, ideas like the “dynamic equilibrium” have bumped up against trends like China’s growing assertiveness in the South China Sea, which do not exactly seem to help facilitate such a condition. Renowned Indonesia scholar Marcus Mietzner wrote a piece last month characterizing Yudhoyono’s legacy as “mixed,” and I would agree with that assessment of the outgoing president’s checkered tenure. Even though Yudhoyono ushered in a period of stability in the country, many Indonesians expected more from him, particularly after he was elected to a second term in 2009 with a strong mandate. If only the outgoing president could have been a little more candid himself about his own legacy. Compared with his predecessor, the Indonesian president has a very different foreign approach.